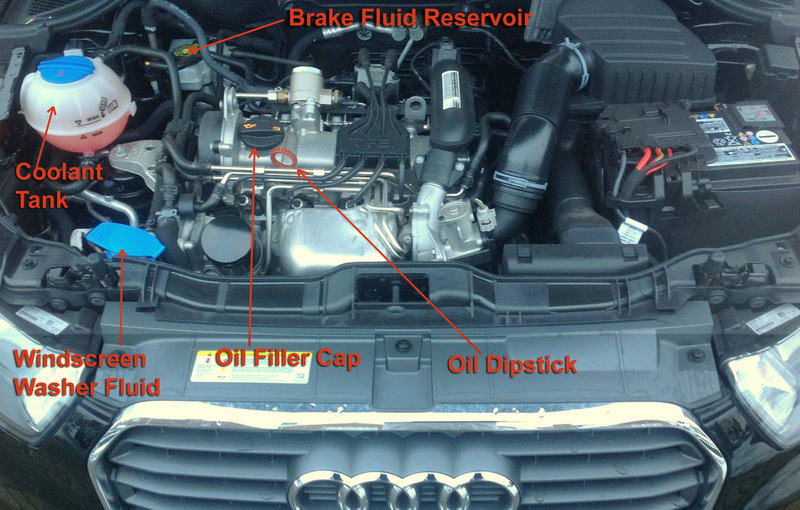 Identify the brake fluid reservoir and explain how to check the level against min / max marker. Explain how the steering wheel is heavy before the ignition is switched on, once you have started the engine the steering will become noticeably lighter indicating the power assisted steering is working. Identify dipstick, explain how you would check the oil level against the minimum and maximum marker and identify where you would add the engine oil. MUST only be checked and refilled when engine is cold. Open the bonnet, Identify where the windscreen washer reservoir is and tell me how you would check the windscreen washer level? Identify the reservoir and explain how to refill. Show me how you would check that the horn is working (off road only)? Show me how you would check that the brake lights are working on this car? to help you check them (the examiner can exit vehicle to check your brakes). and the vehicle should not pull to one side. Tyre pressures are written in the manufactures guide book and in the door frame of this car. Take the car to a garage to use their pressure gauge, check and adjust pressures when tyres are cold, don’t forget the spare tyre and remember to refit valve caps. keep safe control of the vehicle? The minimum tread depth allowed is 1.6mm across the central ¾ of the breadth of the tyre and around the entire outer circumference. There should also be no cuts or bulges. Tell me how you would know if there was a problem with your anti-lock braking system? Show me how you would switch on the rear fog light(s) and explain when you would use them?